The addition of the eight Omron Innovation Labs throughout Europe offer automation support to local customers in local languages and feature robotics democells for highly practical automation applications. 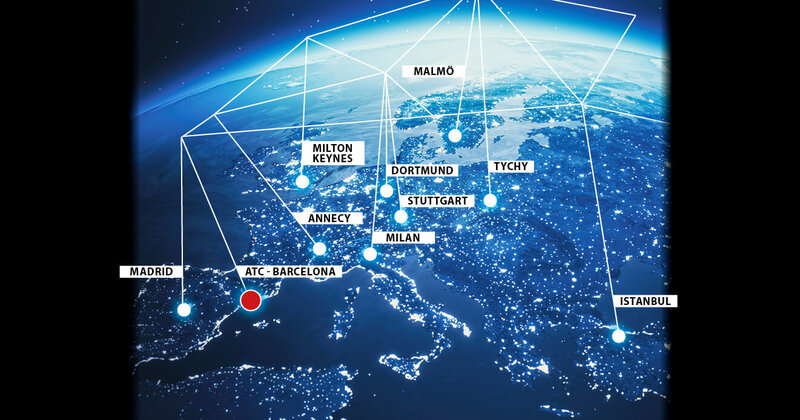 Supported by the European Automation Technology Center (ATC) in Barcelona that continues to address the needs of international integrators and partners. You are invited to gain hands-on experience with automation technologies and work together to implement improvements. The eight Omron Innovation labs throughout Europe offer an example system with a fully automated environment, including mobile intralogistics. Check for your nearest location on the map below. Where the Omron Innovation Labs offer automation support to local customers in local languages and feature robotics democells for highly practical automation applications. 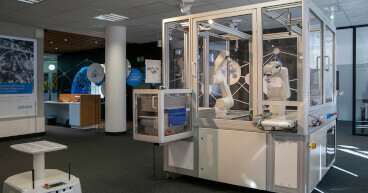 The Automation Technology Center Europe (ATC) is bigger and more research-oriented. It showcases more advanced solutions, addressing the needs of international integrators and partners. The ATC collaborates with OMRON ATCs in Japan, Asia Pacific, China, Korea, and America in exploring the use of the new technologies such as CNC, AI, mobile robot integration with factory, and Industrial IoT. We have striven to break free of the stigma of being merely a components manufacturer. Experience the continuous evolution of our technology from conventional standalone control devices to application-based elements. Using our control devices and a wide variety of demonstration machines, engineers can also carry out training designed with customer control issues in mind. The Automation Center/Laboratory introduces customers to our automation concepts in an effort to inspire manufacturing innovation. Integration: Engineers use demonstration machines to perform demonstration-based verification. Intelligence: The Automation Center introduces various examples of quality and product improvements implemented at our Ayabe Factory. Interaction (new methods of cooperation between people and machines): Experience the movements and actual motions of robots.